July 1979 issue of FM with feature on Doctor Who. Mint condition. Doctor Who was produced in Great Britain and had a large following of fans. Four different actors have played Doctor Who over the years. 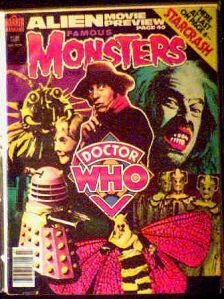 This cover features Tom Baker in the role. Website design and hosting by Sohodojo Business Services. Item 131 of 466 items displayed in viewer. 0 items in cart.